Labor’s plan to end negative gearing and change the capital gains tax would result in fewer homes being built across the country and the loss of thousands of full-time jobs, according to a report. Within five years of the Labor property policy being implemented, up to 42,000 fewer homes would be built in all states and territories, with the loss of 32,000 full-time jobs, according to the independent economic modelling by Cadence Economics, which was commissioned by Master Builders Australia. “Labor’s policies on negative gearing and CGT fails its own test,” said Denita Wawn, the head of the building and construction body. “Master Builders calls on the ALP to rethink their policies in the light of this new research and a changed housing market. Australia cannot afford for housing supply, building activity and employment to go backwards,” she said in a statement. Clearly, by encouraging investment into existing dwellings, current tax settings (i.e. negative gearing and the CGT discount) are part of the problem, not the solution. Here we have Labor proposing to restrict negative gearing to new homes only, thus channelling investment into the exact thing that the MBA is lobbying for – new supply – and boosting jobs for its construction members. And yet, the MBA is staunchly opposed to Labor’s reforms? It doesn’t make sense. 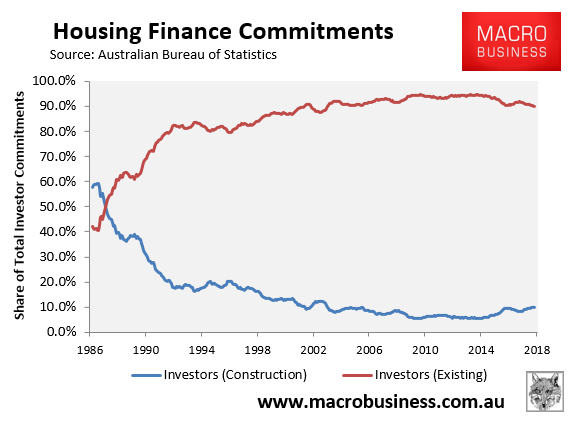 “Currently the framework seeks to channel foreign investment in residential real estate into new dwellings in order to increase the housing stock for Australians to build, buy or rent. Foreign investment is encouraged in new dwellings whether they be apartments, units or homes because in addition to creating more supply, it also creates more jobs for the building and construction sector – all of which helps to grow our economy”. I can only speculate that the MBA cares more about protecting the value of its developer member land banks, rather than actually boosting dwelling construction. Otherwise, why would it go to such great lengths and expense to oppose Labor’s ‘negative gearing for new homes’ policy? A reduction in the CGT discount is likely to turn off investors from buying new and established property. Investor commitments to new construction has risen considerably in the past few years (per your own chart). What share of new homes are investors buying? If they are funding say 20% (I don’t know what this number is) of new homes, is it really that hard to imagine the CGT changes could turn half of them off buying (and have a negative impact on construction as MBA describes)? 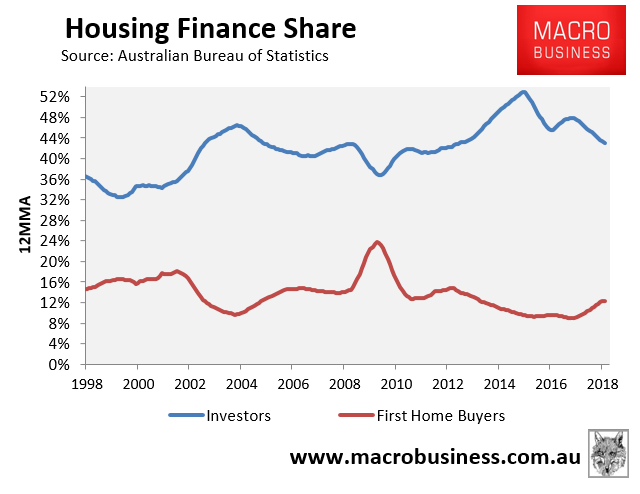 Many property investors may be able to continue negatively gearing new investment in established homes against investment income (see https://medium.com/@josephskewes/impact-of-labors-negative-gearing-policy-on-home-prices-93435b5099fd)? The Labor policy will need to be tightened if it’s going to really “restrict negative gearing to new homes only”. I don’t think there is an obvious outcome to the policy changes. We will have to wait and see how investors behave. Perhaps – but this modelling does not make a strong argument. The modelling looks at the problem through an “excess burden of taxation” lens which assumes Labor’s NG/CGT policy functions as a blanket new tax on investors. This ignores the fact that the new tax doesn’t apply if investors simply switch to new builds. It’s more of an incentive than a new tax. Certainly some investors may choose not to switch to new builds but the impact will be nowhere near the scale assumed in the modelling. You may be right re the scale. I don’t think the exact outcomes can be predicted by anyone, we can’t assume the changes (combined) won’t have a negative impact on investment in new homes (& related industry). At the end of the day, the tax changes might not change anything. Capital gains in new supply areas (such as inner city high rise apartments and new subdivisions on the outskirts of town) are very low, compared to capital gains on established properties in desirable inner city and suburban areas. Investors may choose to wear the lack of negative gearing in return for the higher capital gain, and simply carry forward the losses to be offset against the capital gain when eventually sold. Investors with other properties or shares will be free to buy established homes wherever they like as they can still negatively gear against other investment income – and will be incented to buy wherever capital gains are the greatest. Exactly. Very presumptuous to guess exactly how investors will react IMHO. NG and CGT are just one cog in a very complex machine. If we really want plenty of affordable housing the objective should be what has proved so successful in Perth. A residential vacancy rate of at least 4% and more than 5% during the “healing phase” otherwise known as an extended decline in rents and prices. To get there we need as much encouragement for new constructions as possible. The ALP policy of limiting NG to new builds is a good idea but they should consider maintaining the current CG discount at 50% for new construction as well. Labor will halve the capital gains discount for all assets purchased after a yet-to-be-determined date after the next election. This will reduce the capital gains tax discount for assets that are held longer than 12 months from the current 50 per cent to 25 per cent. The important thing is that the residential vacancy rates in many Australian cities are still far too low. In Sydney they have been too low for over 20 years. While excessive immigration is certainly a large part of the problem a bigger problem is that we have not targeting a healthy residential vacancy rate of at least 4%. A health vacancy rate like the one they have had in Perth over the last 5 years works well even when mortgages rates are being manipulated to the lower bound by the RBA and its offshore buddies. The BIG AUSTRALIA ponzi crowd should be falling over themselves to support both NG limited to new constructions but also a nice fat CG discount on new construction as well. Afterall they are the ones who want to sink as much capital as possible into supporting population growth. Not the brightest, this lady — 10 seconds of Youtube footage will confirm. You’d have to think that being one of these “independant consultants” would have to be the biggest lark in history. The MBA comes to you with the outcome of what they want in a report. They then give you hundreds of thousands of dollars and you hand the outcome guidelines off to the free intern to rewrite and you go off to lunch in your masseratti. Job done!